Whiskey Flasks | Pink Lady Flask, 6 oz. This one is for her. A 6 oz. 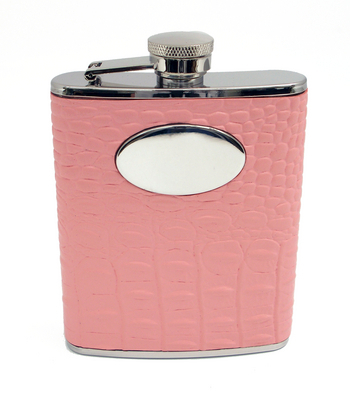 pink leather bound stainless steel flask with captive lid. Gift boxed. Create a personalized flask by choosing from the Available Options above. This one is for her. A 6 oz. pink leather bound stainless steel flask with captive lid. Gift boxed with funnel, make it extra special by having it engraved.